Fresh herbs add bright flavor to these quick and easy Herbed Grilled Potatoes in Foil – the perfect BBQ side dish for anything you put on the grill. Long, lazy summer nights are made for BBQs, and these Herbed Grilled Potatoes in Foil are a must have for any seasonal grill out. 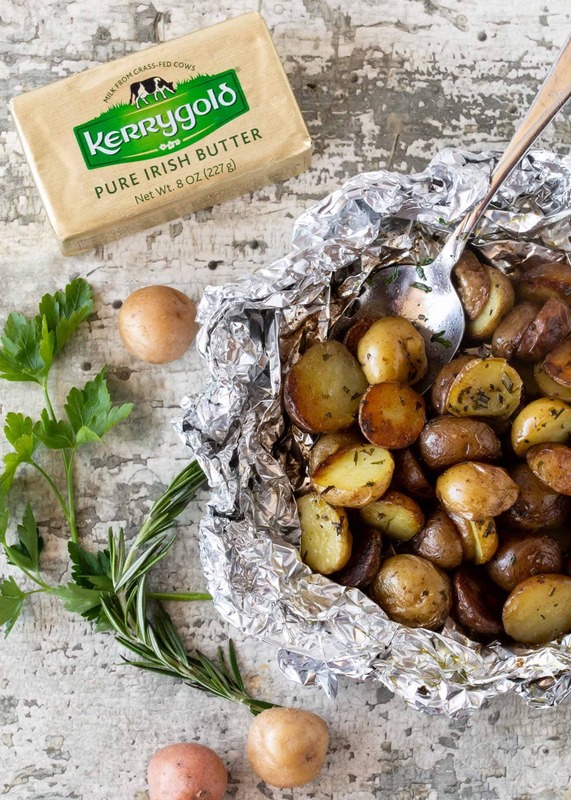 Quick, easy and simple to customize, these foil potato packets will become your go-to side dish for backyard entertaining. 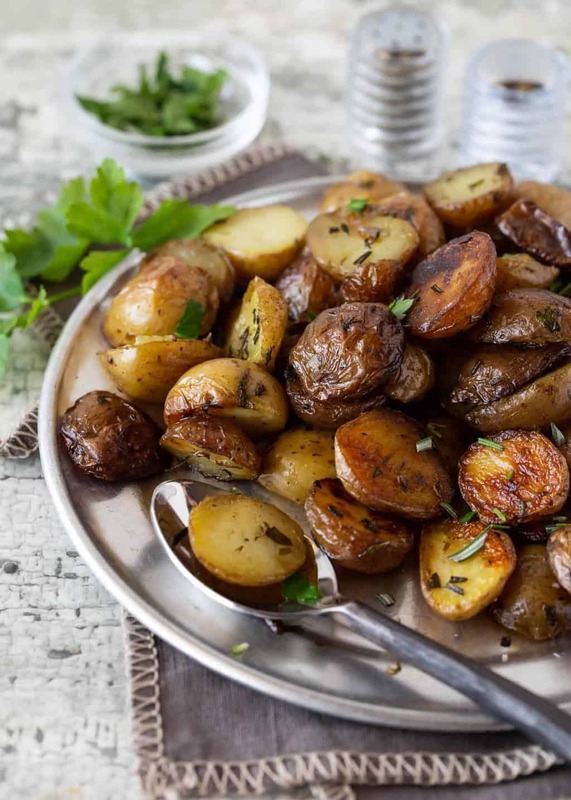 What kind of herbs can I use in this foil potato packet recipe? The sky is the limit! I used a combination of parsley and rosemary in my recipe, but feel free to swap in whatever you have available. Oregano, thyme and even sage would be equally delicious. 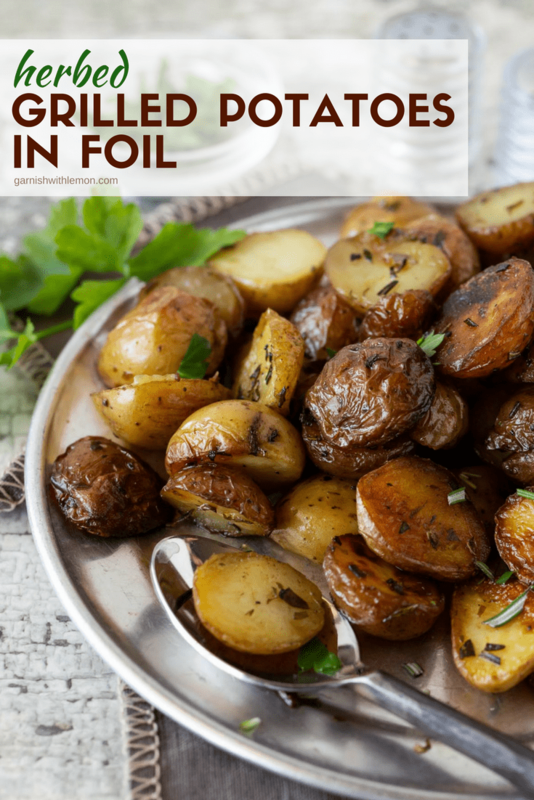 Why use butter and oil in this grilled potatoes in foil recipe? The combination of oil and butter allows the potatoes to be roasted at a higher heat than if you simply used all butter because the smoking point of oil is higher than butter. But don’t forgo the butter entirely! It adds a delicious, rich flavor to every bite, especially when you use my favorite grass-fed Kerrygold Salted Butter. Do I have to parboil my potatoes before grilling? No, you don’t, but I find that parboiling (or partially cooking) your potatoes before grilling them in foil packets will help them cook faster and brown more evenly. And everyone knows that people love those gorgeous, crispy brown potato bits the best! Place potatoes and water in microwaveable bowl. Cover and cook for 5 minutes or until potatoes are just fork tender but not falling apart. Drain. Stir together butter, oil, herbs and salt and pepper to taste. Toss potatoes with herbed butter mixture. Place two pieces of heavy duty aluminum foil on top of each other. Pour the potato mixture onto foil. Fold and seal edges to form a packet. Grill for 30-35 minutes, turning every 8 minutes. Serve warm.